Established in 1995, the Conservation Technology Support Program annually awards grants of equipment and software to conservation organizations to build their Geographic Information Systems (GIS) capacity. The program has awarded 200 grants worth over $4 million in donated equipment and software - it has also assisted these grantees with training and technical support. 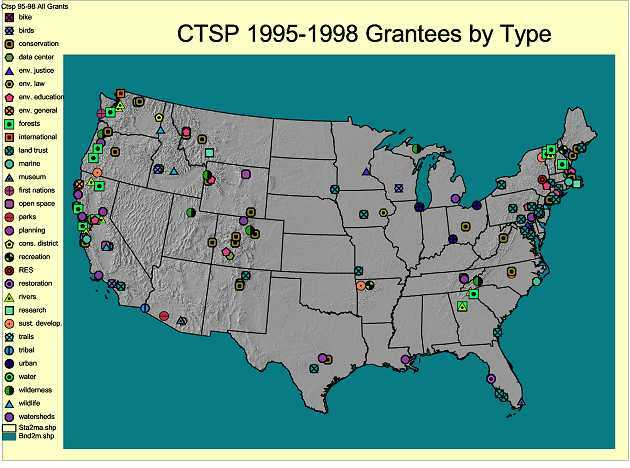 CTSP provides grantees with integrated packages of powerful computers and printers, and mapping software and data. Each year, approximately 50 such grants are made to groups all over the United States (applications are distributed in the fall and then intensively reviewed by expert volunteers, with awards made in the early spring of the following year). The Conservation Technology Support Program (CTSP) empowers conservation and environmental non-profits to make clear the geographic and other dimensions of their issues, goals and strategies, by providing the computers, software, training and support needed to effectively use Geographic Information Systems and other technology tools.